Polyurethanes have occupied the highest position in the realm of surface coatings due to their outstanding properties such as abrasion, corrosion resistance and resistance to extremities of weather(1-5). The urethane coatings are chiefly classified as per ASTM into five categories, viz., oil modified, moisture cured, blocked, prepolymer catalysed and two-pack systems. In the present paper, the two-pack system has been selected for the study of the hydroxyl functional polymers, viz., acrylics, expoxies and their combination in different rations as a base and a proprietory aliphatic isocyanate adduct as a curing agent. The acrylic polymer was synthesized and characterised in our laboratory, while a proprietory epoxy has been chosen for this study. The base paint of acrylic, epoxy and their combination in the ratios of 3:1, 1:1 and 1:3 were made using the ball milling process. The base paint and the isocyanate prepolymer adduct (curing agent) were mixed in a stoichiometric proportion and were applied over the epoxy primed mild steel panels. The performance of this cured film was checked after 7 days of drying. The raw materials used in this study are listed in Table 1. All the solvents chosen for this study were confirmed to be moisture free. The materials like Desmodure N-75 and Araldite 6097 were used, as supplied, after their characterisation. Into the Kettle equipped with a nitrogen inlet, a mechanical stirrer, a heating mantle, a reflux condensor and an addition funnel were placed 56 PWB of cellosolve acetate and degassed with nitrogen for 15 minutes. Simultaneously, the cello-solve acetate was heated to 140Â°C. and maintained at that temperature. To the premix monomers, in the requisite composition, the catalyst was added and matured for 10 minutes after dissolution. This monomer mix containing the catalyst was taken into the addition funnel and charged into the reaction kettle in 5 hours at an uniform rate maintaining the temperature at 140 Â± 2Â°C. After completing the addition of the monomer mix, the charge was digested to get a consistent viscosity and non-violatiles. The resin solution was filtered and characterised for its physical constants. The purchased Araldite 6097 was converted into a solution and characterised for its physical constants. The acrylic and epoxy systems described above were mixed in different desired ratios and characterised similar to the parent system. While the paint was made with each experimental resin, viz., acrylic, epoxy and their combinations using the ball milling technique with TiO2 pigment. The consistency of all the paints were brought to 100 to 120 seconds on Ford Cup B4 at 30Â°C. The PVC of the paint was maintained in the range of 13-17% with a volume solids 42-45%. 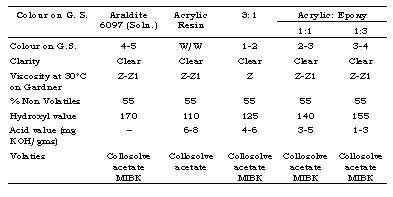 The details of paint formulation are summarized in Table 3. A two-component epoxy red oxide zinc phosphate primer was applied on sanded M. S. panels at a dry film thickness of 30-35 microns. The primer was allowed to dry for 24 hours before the topcoat of the experimental paint was applied at a dry film thickness of 35-40 microns. The painted panels were allowed to dry at an ambient temperature and at a relative humidity of 65% for a period of 7 days. The dry film thickness of the total system was maintained at 70-75 Microns. Panels prepared by the above technique were evaluated for the performance conforming to standard test methods. The test methods and ASTM Number are (i) Mechanical Properties such as Scatch Hardness, Adhesion, etc. (ASTM B 3359), (ii) Flexibility on Conical Mandrel (ASTM D 522), (iii) Erichsen Cupping Value (ASTM D 5870). In the case of chemical resistance, 10% sulphuric acid, 10% NaOH and 10% NaCl were chosen. Salt Spray (ASTM B 117), Humidity Resistance (ASTM B 2247), Boil Water Resistance were selected for assessing the corrosion resistance. For Weather Resistance, QUV (UV exposure 4 hours at 50Â° C and condensation 4 hours at 45Â°C conforming to ASTM G 53) has been chosen and exposure was continued for 1 month. In Table 2, the physical constants fo acrylic, epoxy and their combinations at different ratios are given. The isocyanate requirement has been calculated on the basis of the hydroxyl value considering the isocynate content of Desmodur N-75 at 16.5%. The Stoichiometric ratio of 1:1 was maintained in all cases. However, the PVC (13-17%) and volume solids (42-45%) could not be maintained at the same level because of different viscosity pattern. But the final testing, evaluation and comparison have been done at the same dry film thickness of 70-75 Microns of the composite system. The drying time and initial appearance of all the systems were found to be comparable to each other. 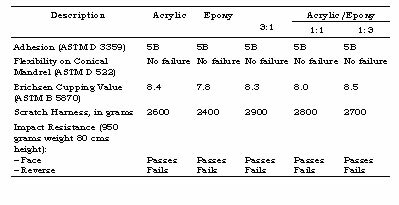 Mechanical properties, particularly scratch hardness of acrylic epoxy system (3:1) was found superior as compared to acrylicurethane or epoxy-urethane. 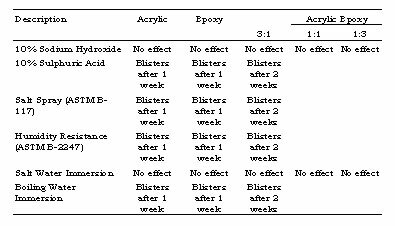 The chemical resistance, particularly 10% sulphuric acid of acrylic-epoxly (3:1), was superior to either acrylic-urethane or epoxy-urethane. Acrylic-urethane (3:1), however, has a comparable chemical resistance in 10% NaCl and 10% NaOH to that of the epoxy-urethane system which is known for its chemical resistance. 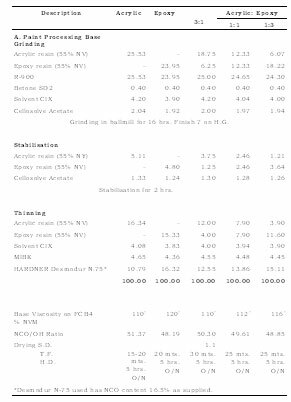 Corrosion resistance data given in Table 5 clearly indicates the superiority of acrylic-epoxy (3:1) system as against the acrylic-urethane or epoxy-urethane systems. As far as weathering resistance in terms of QUV is concerned, acrylic-epoxy (3:1) was found to be retaining 50% of its original gloss without any film defects for 1 month, whereas epoxy-urethane turned out to be totally matt and acrylic-urethane showed 85% of gloss retention. Based on the above results and discussions, it can be concluded that the epoxy-urethane system is well known for its excellent chemical and corrosion resistance, but poor outdoor durability. On the other hand, acrylic-urethane is an ideal system for exterior durability with moderate chemical and corrosion resistance. The combination of acrylic-epoxy cured with urethane prepolymer has resulted in a coating system superior to either epoxy-urethane or acrylic-urethane. Among the acrylic-epoxy base of 1:3, 1:1 and 3:1 w/w, the acrylic-epoxy system of 3:1 cured with urethane prepolymer showed an excellent performance in mechanical, chemical and corrosion resistance with 50% gloss retention in QUV exposure. Further, this paper gives a scope to make a tailor made urethane coating by a proper selection of the acrylic-epoxy resin combination to achieve a variety of coatings on different substrates in different environments.